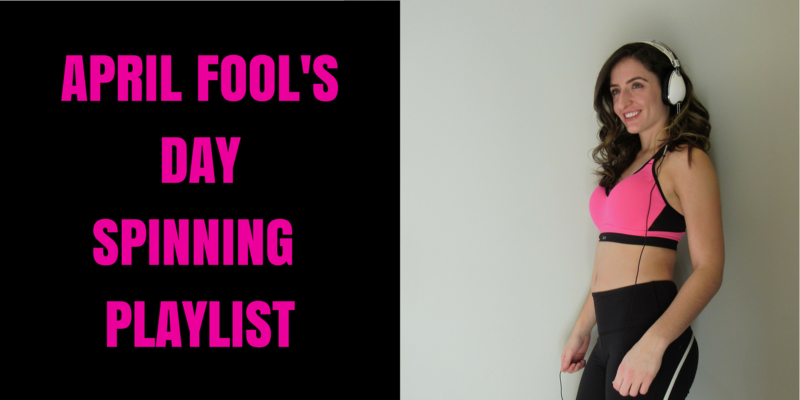 My spin class participants have become obsessed with wacky themed playlists, so I couldn’t pass up an opportunity to create an April Fool’s Day spinning music playlist and routine, knowing the silly song selection I’ll have to choose from. Themed spin playlists are a great way to mix up the typical Group X class and energize folks to focus and work hard. Personally, I like to push the edges of my themed playlists, and add songs that don’t quite fit into the theme. That’s because those are the songs that end up being great ice breakers, comedic relief and, frankly, the most fun. I thought I’d really try to push the envelope with my April Fool’s Day spinning playlist and routine. Not in a way that would put people off, but it a way that would make them chuckle or do a mental double take. Because, that’s why participants show up to my class: to get a different, more challenging workout than they would on their own. Without further ado, here is my April Fool’s Day spinning music playlist and routine. As you know, I like to teach my spinning classes in a series of exercises that we do twice or three times through, depending on the series. So, I pick a couple exercises to make up my series, and we stick to it throughout the class. That way, participants know what to expect, so they can go big when they’re supposed to and not hold back for fear of another interval around the corner. Here’s the series — do it three times through. Each song in the series increases resistance, so participants will continue to add resistance throughout and maintain it as they go from Song 1 to Song 3. At the end of Song 3, that’s when folks will go back to their flat road baseline and start over. Song 1: “45 second drill”. Every 45 seconds, ask participants to increase intensity, either by going faster or adding resistance. Participants will start in moderate intensity, transitioning to hard intensity, then harder, and finally breathless intensity. That’s four segments of work in the song. Then, participants can recover with the remaining time and heading into the next song, while keeping the resistance on the bike. Song 2: Feet slow just a bit to keep up with the pace of the song. You’ll add resistance throughout the song to increase the intensity, starting seated and working your way to standing once resistance is heavy enough. You’ll start in a high moderate intensity level, and will end at a hard intensity level standing. Song 3: Stay standing. For the first minute or so, ask participants to add resistance to get the resistance super heavy. Then, you’ll do what I call “Reverse Tabata”. It’s 10 seconds of breathless work, and 20 seconds of recovery. We do it 4 times through. I like to start the sprint with a countdown. On 3, participants stay standing and start to sprint. On 1, participants will keep that breathless, sprint pace and have a seat, keeping the pace for the next 7 seconds seated, totaling 10 seconds of work. Then, we stand and recover for 20 seconds, and do it again. Starting the sprint standing helps participants to set the pace before having a seat, otherwise it’s nearly impossible to sit and pick up the pace at the same time. Hope you enjoy! If you’re looking for more spinning songs and playlists, check out the workout routines and playlists page.